The Bluegrass State is filled with opportunities to take to the trails and explore some of the most scenic parts of the country. From horse country to the Appalachian Mountains, Kentucky has a wide variety of options for hikers—including the biggest cave system in the world. Between the Daniel Boone National Forest, Mammoth Caves National Park, and more than 50 state parks, there are endless opportunities to take to the trails. Here are 10 of our favorites. Located in the Daniel Boone National Forest, this park in Slade, KY, offers more than 19 miles of hiking trails, as well as a 60-acre lake for paddling and fishing. If you want to spend the night, a lodge is available as well as tent and RV camping. 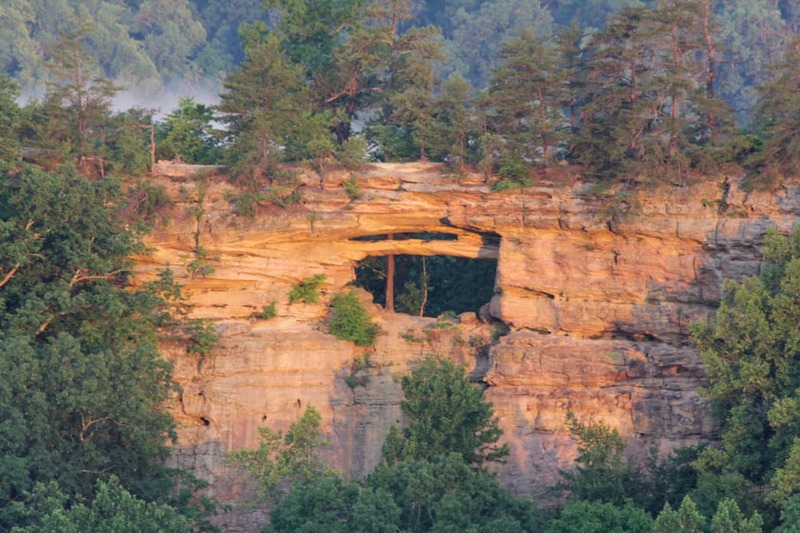 The park’s signature sandstone arch creates a natural bridge that’s not to be missed. The most challenging hiking trail in the park is the 7.5-mile Sand Gap Trail, which begins about 500 feet from the natural bridge. For the first half of the loop trail, you’ll follow an old logging road along the mountain ridge. From there you descend to more challenging terrain, losing elevation until reaching the Lower Hood Branch River. There you’ll get an excellent view from below the cliffs as you hike through rhododendron thickets. If you’re not up for the 4-6 hour hike, there are plenty of other shorter hikes in the park that show off the sandstone rock formations. 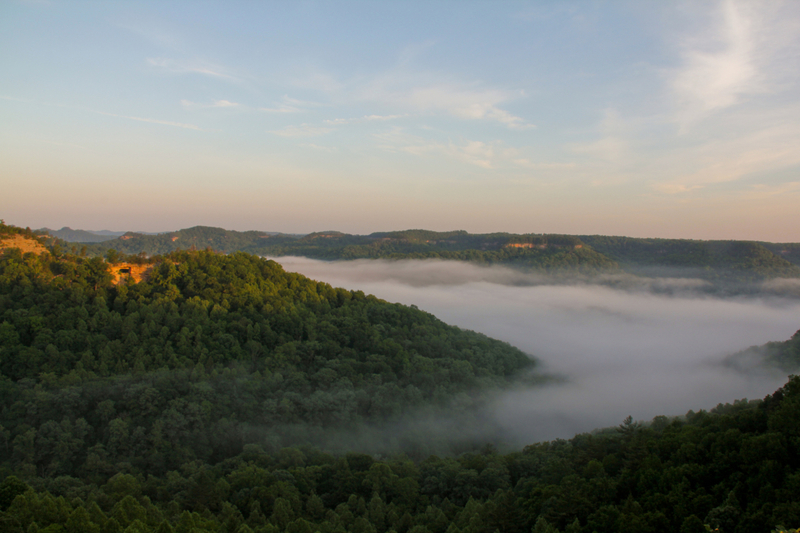 The Red River Gorge is adjacent to the Natural Bridges State Resort Park, and it’s one of the top climbing destinations in the Southeast . This National Natural Landmark features 29,000 acres of cliffs, rock formations, waterfalls, swimming holes, and natural arches. For hikers, the Gladie Visitor Center near Stanton, Kentucky, is a great place to get started and learn more about the area. (It is, however, closed in the winter.) The Sheltowee Trail (below) runs through the Red River Gorge, but it’s just one of the several dozen named trails in the area. The trails around the Koomer Ridge Campground are moderate hikes that offer plenty to see in a small area. By including the Rough Trail, Timber Ridge Trail, and Buck Trail, you can create a 7-mile loop with many scenic overlooks. 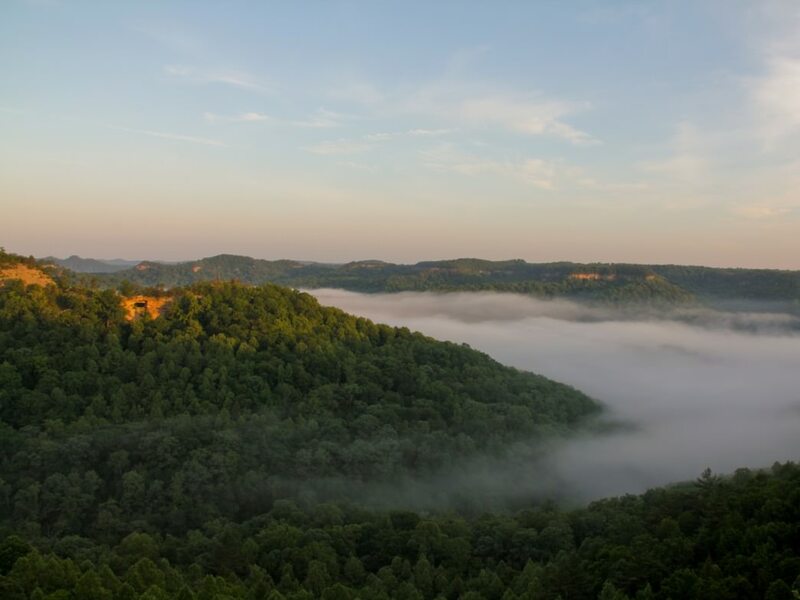 This is Kentucky’s signature hiking trail , a 319-mile behemoth that will take you through the Daniel Boone National Forest starting near Morehead, Kentucky, and finishing up at Pickett State Park in Tennessee. While primarily a hiking trail, there are sections that do allow mountain biking and horseback riding. For thru-hikers, the trail hits the most scenic parts of the state, including the Red River Gorge, Cave Run Lake, Laurel River Lake, and the Big South Fork. 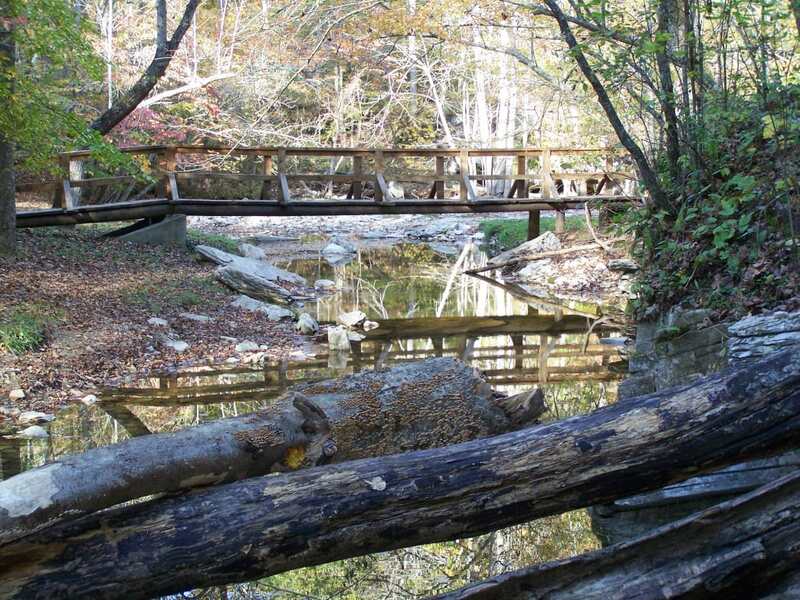 Considered the “backbone” of the Daniel Boone National Forest, the Sheltowee Trail offers connecting trails throughout its length, making it easy to create short loops for day or weekend hikes. A trip on the Sheltowee is also a trip back in time, with old homesteads, gas and oil wells, and other remnants of developments long abandoned. 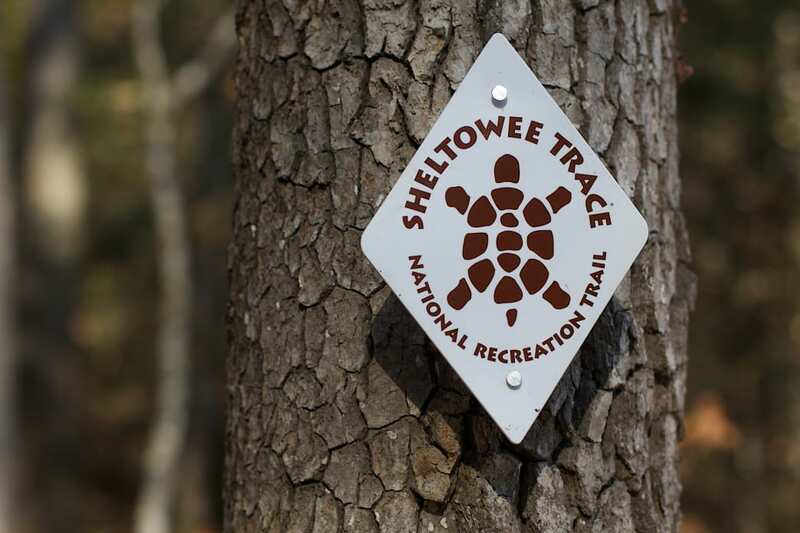 The trail gets its name from the name that Chief Blackfish of the Shawnee tribe called Daniel Boone, which means “big turtle.” As such, you’ll find images of turtles to mark the route. The seven-story waterfall, called the “Niagara of the South” by some, gives this park its name and its signature attraction. Near Corbin, Kentucky, the falls are impressive anytime of the year, but it also features a unique phenomenon visible in the right conditions—a moonbow. During a full moon under the right conditions, the 125-foot waterfalls create a rainbow effect at night that’s not to be missed. 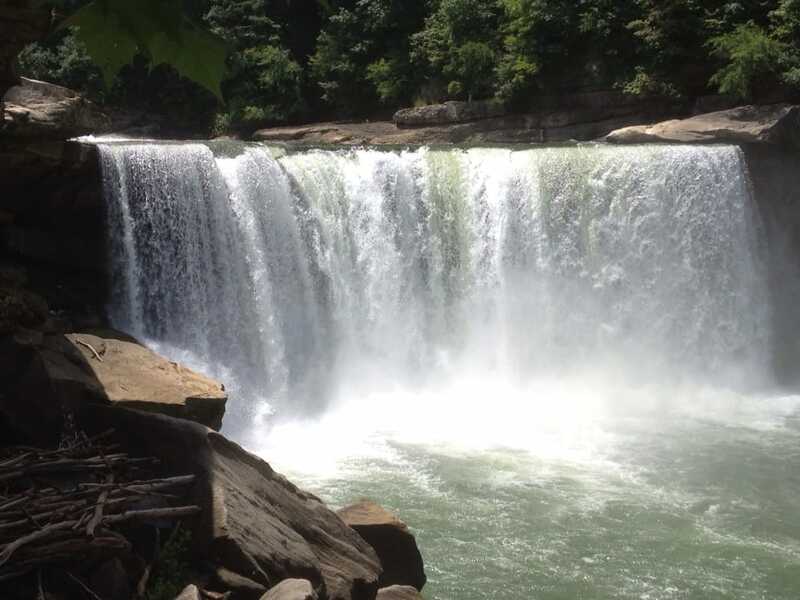 The 10.8-mile Moonbow Trail starts at the falls and ends at the mouth of the Laurel River. You can also create a 7-mile loop with additional offshoots of the main trail. 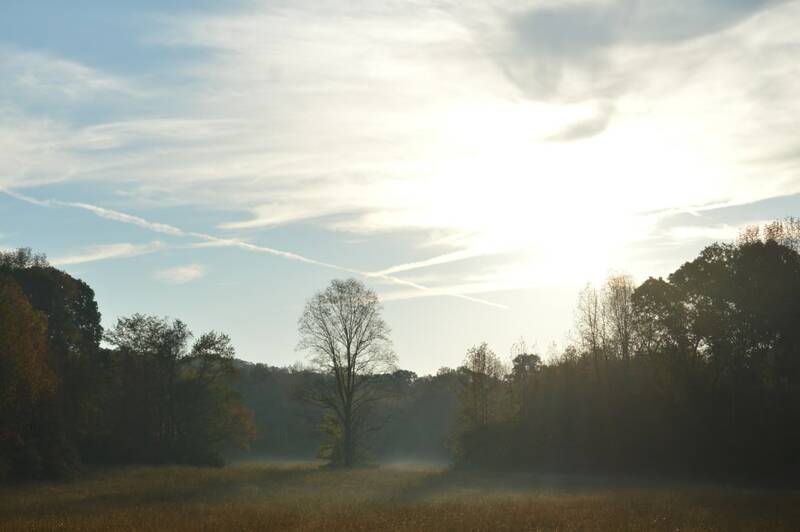 A total of 17 miles of hiking trails are available in the park, in addition to excellent paddling and fishing opportunities on the Cumberland River. The Land Between the Lakes is a U.S. National Recreation Area that straddles the border between Kentucky and Tennessee. Lake Barkley to the east and Lake Kentucky to the west, were both created by damming the Cumberland and Tennessee Rivers, respectively. The result was the creation of the country’s largest inland peninsula, which was eventually designated as a recreation area in 1963. There are plenty of camping options throughout the park, and as you’d expect, a big focus on water recreation. But there are tons of hiking options as well, including the 58-mile North/South Trail, which spans the length of the entire park. The northern section features mostly singletrack trail that alternates between the shoreline, dense forest, and scenic ridges. You’ll find seven springs along the route as well as three backcountry shelters. On the southern section you’ll find more multi-use trail, where you’ll run into horseback riders and cyclists. If you’re looking for a day hike, the Honker Trail, located near the Nature Station, is a 4.5-mile trip around the lake that offers a little bit of everything along the way. The Pine Mountain State Scenic Trail is a work in progress, but once finished it will become part of the 1,800-mile Great Eastern Trail that will run from Alabama to New York, roughly parallel to the Appalachian Trail. The Kentucky section of the trail will stretch from the Pine Mountain State Resort Park in Pineville to the Breaks Instate Park in Elkhorn City. But while the entire trail isn’t finished yet (about 42 of the proposed 120 miles are complete), you can enjoy several of the sections right now. The Birch Knob Section is named for the highest point on this section of the trail, and it runs 25.2 miles from Elkhorn City to U.S. 23. You’ll find both high, dry ridgeline and wet upland bogs along the trail that follows land that has been re-naturalized from homesteads dating back to the 1800s. At Birch Knob, a viewing platform offers spectacular views of Kentucky, West Virginia, and Virginia—and even Ohio and Tennessee on clear days. Located in Lexington, Kentucky, the 734-acre Raven Run Nature Sanctuary is dedicated to preserving the natural beauty of the Kentucky River Palisades. You’ll find more than 10 miles of hiking trails that include meadows, streams, and woodlands that are typical of the area. In addition to the 600 species of plants and 200 species of birds seen on the property, you’ll discover numerous relics from 19 th century settlers in the area. Hikers are asked to remain on designated hiking trails, and no pets are permitted in the park. The moderately challenging, 4-mile Red Trail is the longest in the Preserve, hitting a little bit of everything on a rewarding loop. 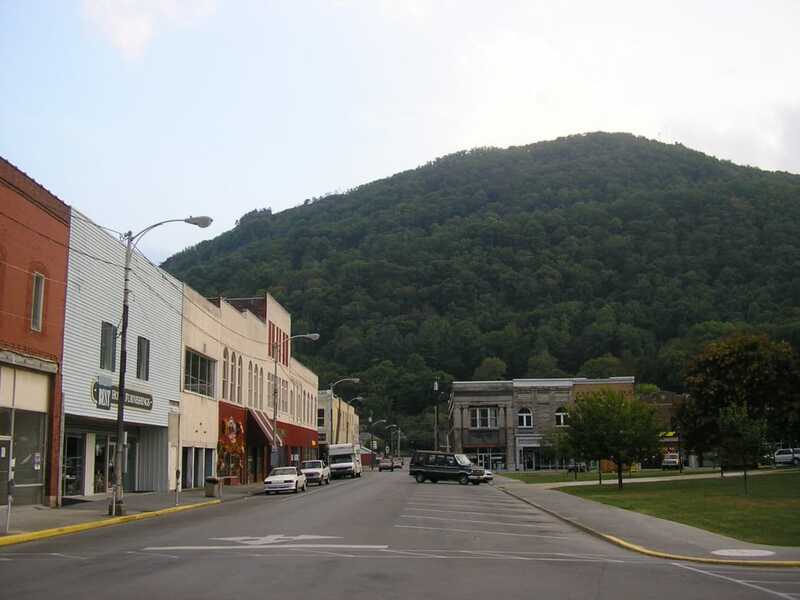 Sterns, Kentucky, prides itself as being one of the top trail towns in the state, with easy access to both the Daniel Boone National Forest and the Big South Fork National River and Recreation Area, which occupies 125,000 acres of the Cumberland Plateau. 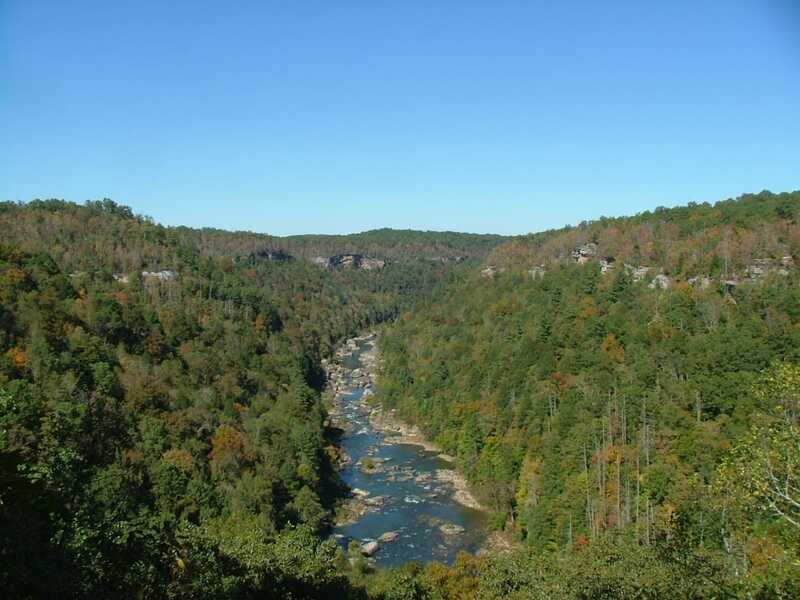 The area is designated to protect the Big South Fork of the Cumberland River, and it includes countless gorges, waterfalls, and sandstone bluffs that make for an epic hiking adventure. One popular overnight hike is the Angel Falls Overlook-Grand Gap loop, which is 11.3 miles in total and starts at the Leatherwood-Ford River Access area just off of Highway 297. Located in the far northeast part of the state, the Carter Caves State Resort Park features the highest concentration of caves in any part of the state, and it’s become a popular spot for rappelling and rock climbing. But even if you don’t head underground—and you prefer to keep your feet on the ground—there are countless opportunities for traditional hiking in the park. For those who do want to explore underground, the park’s two main caves—Cascade and X-Cave—feature guided tours year-round. More than 100 campsites are available in the park to make a weekend out of it. As far as the traditional hiking goes, the park features more than 26 miles of wooded trails—some of which are multiuse and include access for horseback riders and mountain bikers, others for strictly hiking. 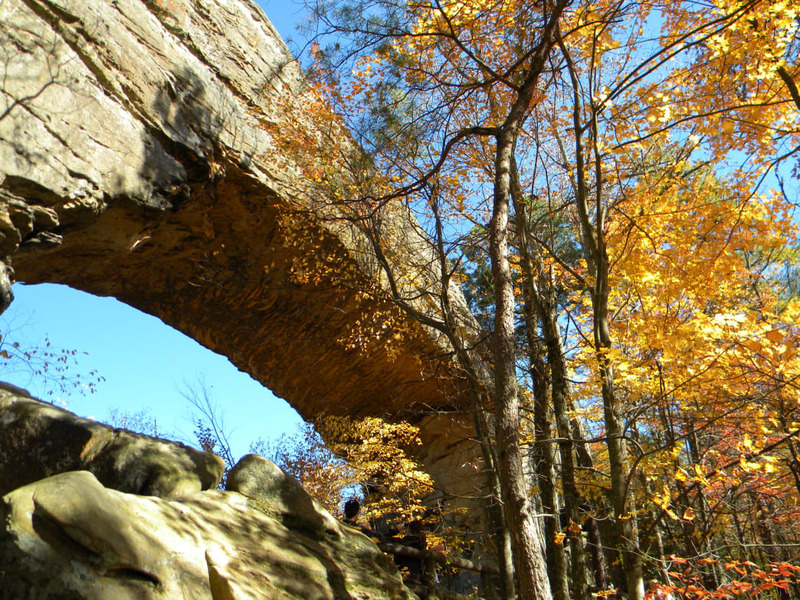 You’ll find an impressive limestone natural bridge (that even supports a highway), sandstone arches, and scenic ridges. 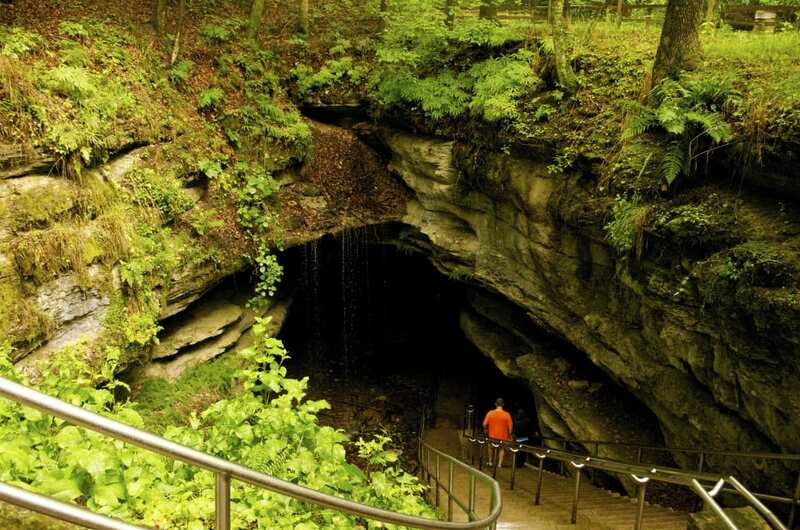 Mammoth Cave National Park may be best known for its underground sights, but hikers will find nearly 84 miles of trail to explore above ground as well. 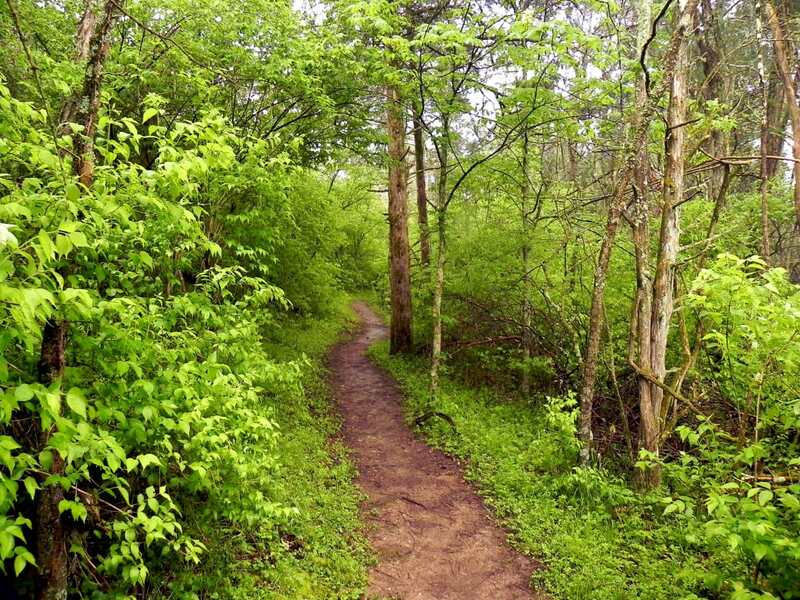 You have plenty of options in the enormous park, including more than 65 miles of backcountry trails, starting from six different trailheads—Maple Springs, Lincoln, Big Hollow, First Creek, Temple Hill, and White Oak. For those interested in staying closer to the amenities, more than 10 miles of front-country trails are also available and accessible from the visitor center. The park features three campgrounds and more than a dozen primitive campsites are available in the backcountry. A hotel and rental cottages are also in the park. For those looking for a long accessible hike, the 8.7-mile Sal Hollow Trail begins at the Maple Springs Trailhead and features rolling hills without much technical terrain.